I love having Taco night in our house. I love it. Since sports have started we’ve had to either eat really early or eat really late dinners depending on the night. Usually we have Taco Thursday night. However, I decided to try these home made tostada shells. Tonight was baseball night at 6pm so that meant we eat afterwards. I cooked the ground turkey and sat it aside while at the game so that was at least done. Sometimes Craig meets us at the game, but tonight he didn’t. I walked in the door to see him eating tacos. He was a bit surprised when I told him that we hadn’t eaten yet. He said he thought it was taco night. Well he missed out on some pretty good tostada shells. 1. Heat oven to 400ºF. Place tortillas in single layer on baking sheet. Spray 1 side of tortillas with cooking spray. Sprinkle evenly with 1 tsp. chili powder. Bake 7 to 8 min. or until crisp. 2. Meanwhile, cook meat and remaining 1 tsp. chili powder in large skillet on medium-high heat 3 min. or until meat is no longer pink, stirring frequently. Add beans (didn’t have beans on hand – sure wish I did) and salsa; cook 4 min. or until heated through, stirring occasionally. Remove from heat. Stir in half of the cheese. 3. Spread meat mixture evenly on tortillas; top with remaining cheese, lettuce, tomatoes (I dislike those red things and skip them) and sour cream. Got a thumbs up from Miss Brooklyn! Mr. Caleb enjoyed his as well! As I said, we have Taco’s at least once a week. This was a fun, new way to enjoy one of our favorite meals. Loved the flavor the chili powder added to the tostada shells. I could have eaten more than I did but used that will power within! Plus I wanted to have one for lunch tomorrow! You could make some home made tortilla chips with the chili powder and cooking spray on the tortilla shells too. That would be good dipped in your favorite salsa. Ended it with a beautiful picture in the sky! 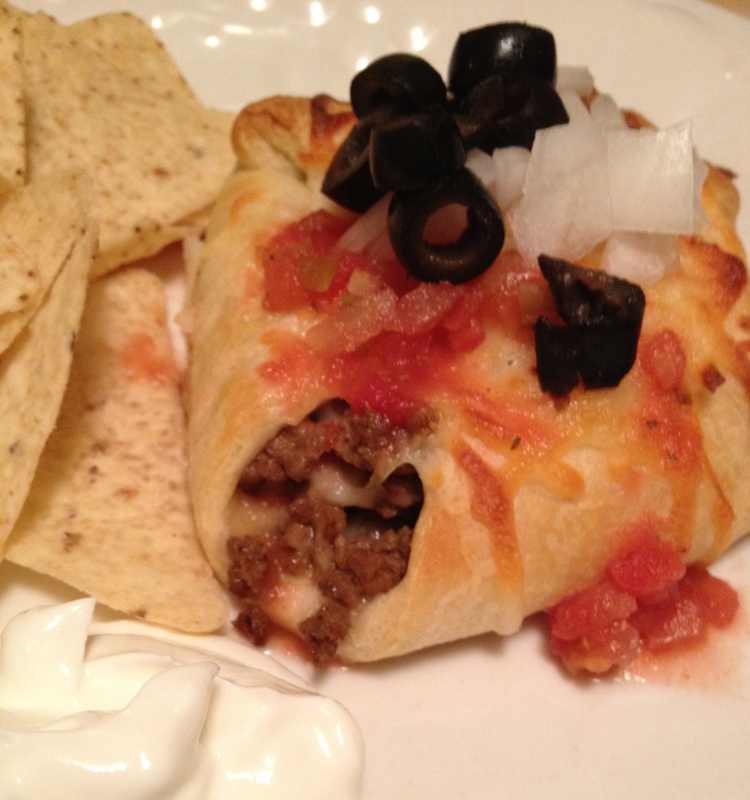 Who would have thought putting taco meat inside of a crescent roll would be good!!?? I loved, loved, loved this. (photo taken by Caleb!!!). I was cleaning out one of my drawers and found a little magazine cookbook and stumbled upon this recipe and let me tell you, it was well worth it. 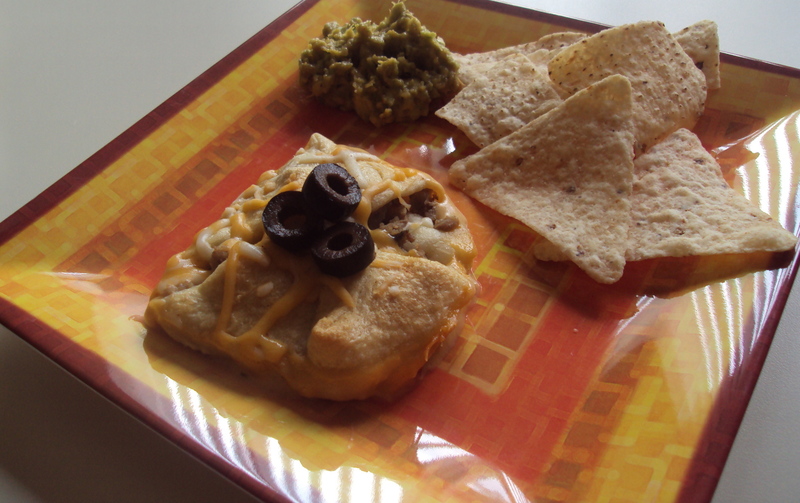 Put this along side some home made guacamole and this was a hit with the kids alone!! I had half of a pan of taco meat left over so next time making this I would use two tubes of the crescent rolls (you would need two cans of soup as well). Preheat oven to 375°F. Spray 13X9-inch baking dish with nonstick cooking spray. Season beef and onion with salt and pepper. Brown beef and onion in large skillet 6 to 8 minutes over medium-high heat, stirring to break up meat. Drain fat. Stir in chili powder, cumin and oregano. Cook and stir 2 minutes; remove from heat. Stir together soup and milk in medium bowl; pour evenly into prepared dish. Separate crescent dough into 4 rectangles; press perforations together firmly. Roll each rectangle to 8X4 inches. Cut each rectangle in half crosswise to form 8 (4-inch) squares. Spoon about 1/4 cup beef mixture into center of each square. Lift 4 corners of dough up over filling to meet in center; pinch and twist firmly to seal. Place squares in prepared dish. Bake, uncovered, 20 to 25 minutes or until crusts are golden brown. Sprinkle cheese over squares. Bake 5 minutes or until cheese melts. To serve, spoon soup mixture in dish over each serving; sprinkle with cilantro, if desired. Serve with salsa, if desired. Have a Happy Memorial Weekend and Happy Cooking. Patricia – Two Girls Cooking….